A Yoga DVD That Will Reshape, Tone, Strengthen, and Unify Your Entire Being! Want to Reshape Your Body? Three Different Level Videos Will Get You There! Would you like for your body to become incredibly strong, lean and flexible? How about it becoming a fat burning machine? You may have tried many things to get in shape, but might not have stuck to your regimen. That's probably because you didn't feel wonderful effects, both short and long-term. Yoga does incredible things for your mind and spirit. It does incredible things for your flexibility and promotes relaxation. But with regular practice, the right sequence and intensity of yoga asanas can literally change your body into a work of art; a masterpiece! I have seen many people that never thought yoga would be something they would like, let alone love, yet some of the most resistant people have become devoted to yoga. You can benefit from my many years of teaching and testing different yoga styles and methods. This Yoga DVD is a system of asanas that I have sequenced through years of testing the best moves, but I won't lie, it will be a challenge! You should try to be consistent with your practice. One day a week of yoga will not give you great results. This Yoga DVD needs to be practiced on a regular basis. Since it is challenging, you may have to break it up into several parts until you get strong. If you really are looking to get into the best shape of your life and reap the rewards of mastering balance, flexibility, focus and incredible strength, all without equipment or gym memberships, this video will give you all that, and more. If you are new to yoga, take it slow! It would be best to view this video a few times before practicing. Watching before attempting to practice will give you a much better understanding of the verbal cues. Once you begin, you will need to modify the tougher moves, or eliminate them for a while. You may want to break the practice up, doing just the beginning of the DVD for a while before adding the standing poses that are in the middle of the video. The last part of the DVD is mostly seated poses and stretches, with a relaxing Savasana. The entire video is just under 1 hour, but it will be the best hour you can spend to strengthen, stretch, realign and reconnect! Click the DVD Icon below to order. 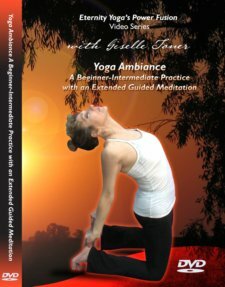 This DVD is perfect for those who are just starting a yoga practice. It's designed to give you improved flexibility, increased strength and better balance. The extended guided meditation will allow you to release stress and bring your awareness inward for total integration of the gifts of yoga. Order by clicking the icon below. This DVD will guide you through an intense forty minutes of the best total body sculpting moves. Feel the power of the most effective core strengtheners, leg work and other exercises that will get you in the best shape of your life in the quickest time. No machines required; just you, me and a mat! Order by clicking the icon below. Additional Advanced Videos, and much more.